Whatever scale and flavor of audio networking the system demands, Soundweb London and DriveCore Install Series together provide the solution. Whether it’s simple point-to-point localized high-channel count within a rack to venue-wide Ethernet-based audio networking, Architectural Media Systems provides it all. 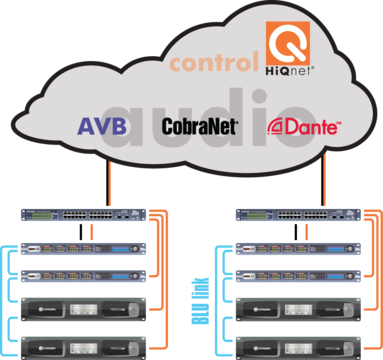 HiQnet Audio Architect includes the capability to route a wide variety of digital audio network protocols from and to compatible devices system-wide over an Ethernet network with AVB, Cirrus Logic CobraNet® and Audinate Dante™. Creating added audio routing flexibility within a HiQnet system design, Audio Architect can also be used to route audio amongst devices on a BLU link ring – Harman’s proprietary low-latency, high-channel capacity digital audio bus. This versatility makes audio routing within Architectural Media Systems as easy as A, B, C, D. It is now possible to move from one networked audio transport to another and stay on the same control platform without needing to learn multiple software applications.